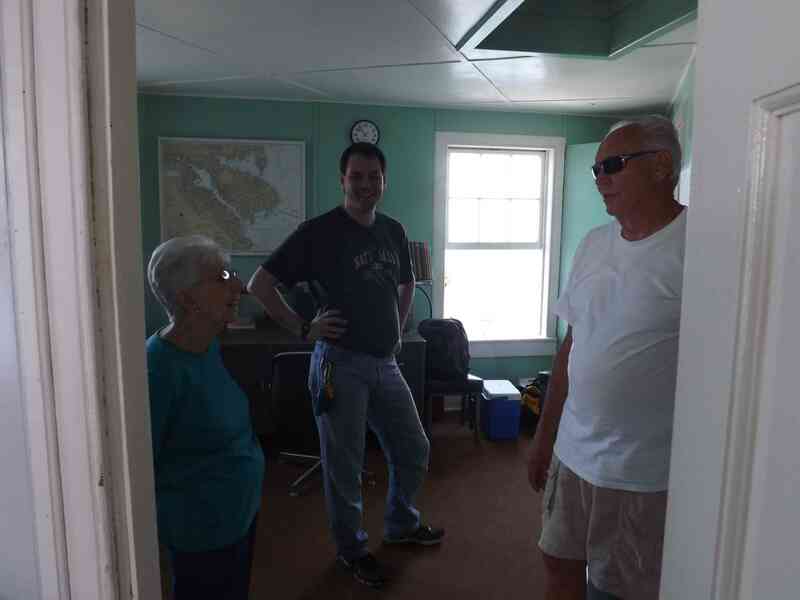 Workday: Thomas Point – July 8, 2016 – Chesapeake Chapter U.S.L.H.S. 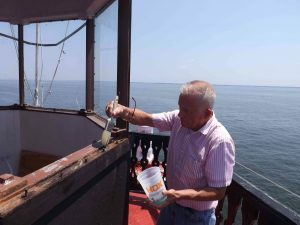 There is an image many have of the lonely lighthouse keeper at his post tending the light. 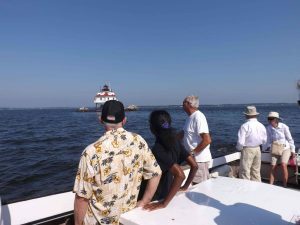 But it was anything but lonely out at Thomas Point on Friday July 8th. 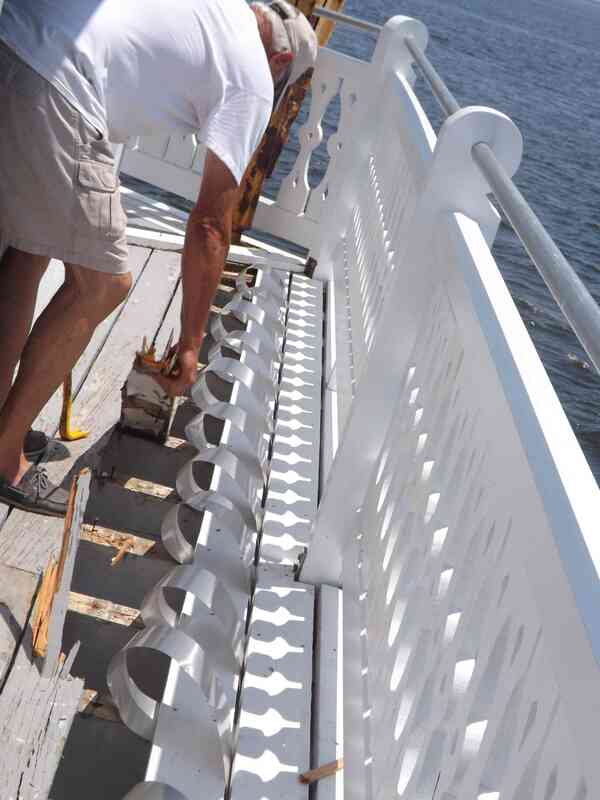 Volunteers went out to do some more work on Thomas Point Light accompanied by 10 guests from a woodworking company. 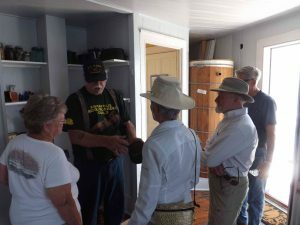 They came out to inspect the siding and got a tour of the lighthouse. 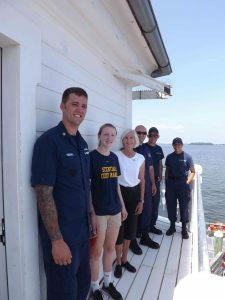 As these guests were leaving a Coast Guard vessel with four active CG personnel on board, retired 5th District RADM Sally Brice-O’Hara (present when TPSLH was awarded to the consortium in May, 2004) and a young recruit pulled up. Volunteers gave them a tour of the lighthouse showing how far the restoration had come. Tony reports they were very impressed with our progress. Once all the guest had left the volunteers got down to work. 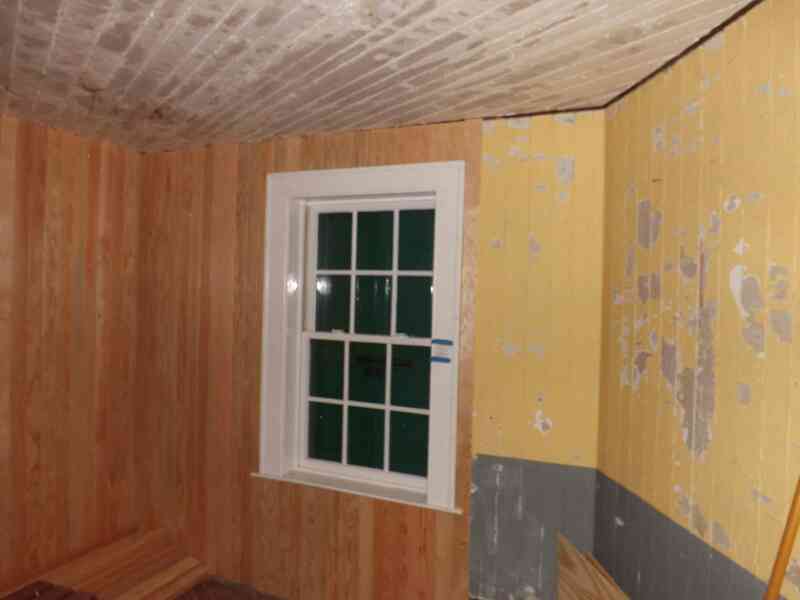 They removed the temporary plexi-glass panel in the lantern room, and applied rust-remover to the frame. 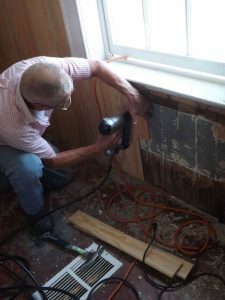 Then they worked on the equipment room wall, nailing siding strips above, below and on the right side of the window frame. They re-attached the plexi-glass pane before leaving the lighthouse. 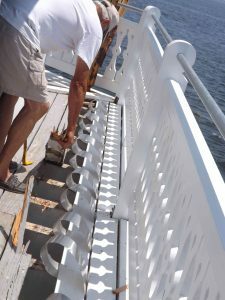 Howard and Cathy got to work on fourth side of the exterior decking after returning the first group of visitors to shore. Several old deck boards were removed and fresh lumber was added. The volunteers left when a storm was threatening and the rain started just as they finished loading the old lumber on to the Audacious. Heavy rain accompanied them back to the dock. Woodworking company guests aboard the Audacious approach TPSLH – Captain Howard in white tee – center. Guests from the US Coast Guard – Retired RADM Sally Brice O’Hara in white blouse, center. Hobie uses nail gun to secure strips to equipment room wall. About half way done with the room wall strips.